You will be given a reference e-book to read which has 345 pages And the test will be based on that e-book , you can take final test within 1 year of purchase. Clean energy which is also known as green energy refers to the kind of energy produced with the help of renewable sources without causing any harm to the environment. Its most basic forms include solar, water and wind. It can also be defined as energy processes that cause less pollution to air or do not cause any pollution at all. It does not also utilize resources that you cannot easily renew. It should be noted that clean energy is mainly taken out of natural processes that are constantly replenished. It usually derives its energy directly from the heat which is generated deeply within the earth or from the sun. It encompasses heat and electricity derived from wind, hydropower, ocean, solar, geothermal resources, hydrogen, biomass and bio-fuels that are usually generated from resources that can be easily renewed. One of the most popular types of clean energy at present is geothermal energy which has the ability to produce approximately two thousand eight hundred megawatts of energy annually. This energy is mainly generated with the help of hot and steam water that naturally occurs beneath the surface of the earth. Solar energy is also another type of clean energy. This is primarily generated from solar cells or photovoltaic cells that are usually created from silicon and work in absorbing the radiation of the sun and using this to produce electricity. Wind energy is also popular which is acquired through a wind turbine which is effective in converting the wind’s kinetic energy into mechanical energy used in producing electricity. 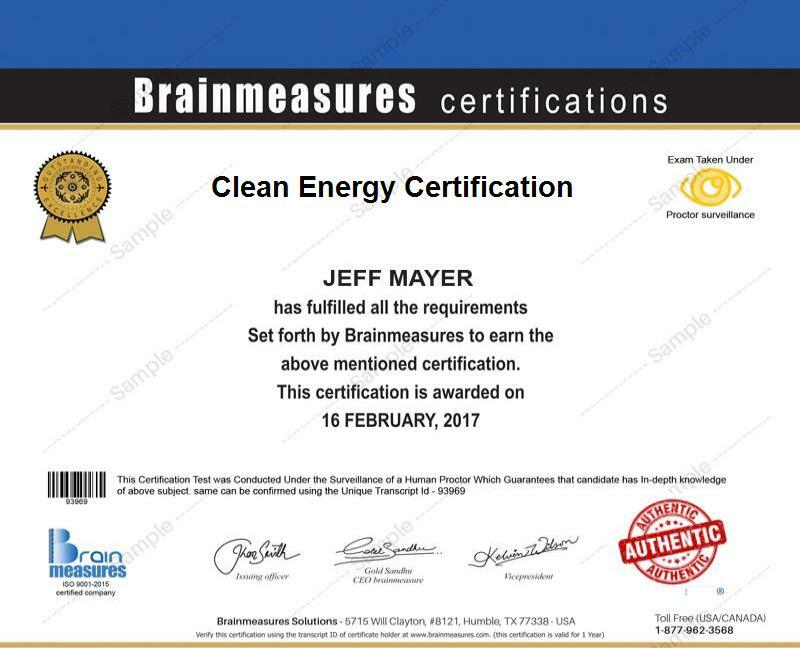 If becoming a clean energy certified professional is included among your major aims, then be aware that you can easily access the clean energy certification program provided by Brainmeasures which is filled with all the information that you need to boost your understanding about this field. The clean energy course provided by this widely recognizable online certification company is a huge help in mastering the most relevant concepts linked to this area. Taking part in this popular online certification program is extremely useful in your attempt to understand how the different types of clean energy works, the individual benefits provided by the different clean energy types, their major objectives, how clean energy can help save the environment and how you can use it to save more on energy costs. Receiving a clean energy certificate from Brainmeasures will prove to the public how proficient and competent you are in this specific field so rest assured that you will enjoy a better career after completing the certification course. How to effectively generate electricity? Taking into full consideration the updated and accurate information stored in the clean energy certification program offered by Brainmeasures, it is no longer surprising if it will continue to benefit hundreds of professionals in this industry. This certification course is actually geared towards general, plumbing and electrical contractors, HVAC professionals, architects, builders, engineers and any other individuals and professionals who wish to undergo a high quality and more professional training in the areas of green building and clean energy. Earning a clean energy certification is also a major help in your attempt to enjoy a significant boost in the level of your income. With the help of your clean energy certification, working as an effective clean energy engineer is possible and this will allow you to enjoy around $65,000 every year. You can also use your certification to work as a clean energy consultant which gives you the opportunity to enjoy around $102,000 to $160,000 annually.